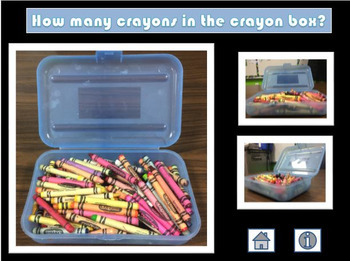 Photo Estimation Jar - How Many Crayons? 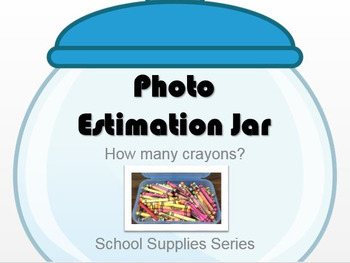 Have you ever wanted to regularly use an estimation jar activity with your students, but didn't have the time to keep up with it or prepare for it? This Powerpoint includes one estimation jar activity. The activity includes 3 pictures of the crayons from different angles, measurements of the crayon box and crayons used, the total number of crayons in the box, and links within the file to skip to various points in the slideshow. The Powerpoint can be used to have students practice estimating the number of items within a container. The activity could be done in as few as 5 minutes or could be used as part of a larger lesson.